Hysteria...for me anyway. I hope you enjoy and if you don't, I am sorry. But for those with dogs - I am sure you'll appreciate occasions such as these. 1) Olive V. Shower - Olive doesn't like to be alone. I realize completely that this is my and hubby's fault. We really enjoy our dog and she likes being with us. This means she doesn't like when we aren't accessible. One of these occasions - when I shower. She likes to jump up and peer in to be sure I'm still there. Our tub is raised so it's unlikely (and a little difficult) for her to try to jump into the shower. However, I don't think she'll be doing this anytime soon. This week, I was in the shower and Olive was asleep on the bed, or so I thought. Sure enough, I hear her little collar jingle into the bathroom. And then a big thunk! Right in the shower goes the shampoo bottle on the edge. This is all combined with a scrapping so desperate and a tail end of buff fur flying from the room. Poor thing must have bumped the bottle when she jumped up to check things out. Olive is now afraid of the shower. Awesome. Let me be the first to realize how super fun bathing her will now be. Needless to say, I've moved the bottle. 2) Maternal Instinct V. Anything Else - Olive and I go for walks now - it's awesome. We are blessed with lovely walking paths nearby. On a separate note, the hubby and I have at least brought up the idea of becoming a larger family. As most possible mother's, I've always wondered if I'd be good at it, will I have that "maternal" instinct, etc. Well - I've got that covered. There was a loose dog on our recent walk. I didn't know I had shackles, but I do and they went up. Potentially ridiculous, I know. In an effort not to scare the dog I didn't scoop her up and run like hell. (For those of you that know me - like running would have gotten me far, seriously?) I walked smoothly, pulled her closer and off we went. No exciting end, but I was incredibly proud that I had that reaction. She's great - my little pup for sure! 3) Olive V. DVD Player - Sleepy Olive tonight and as she's snoozing, I start a movie. The DVD player opens and closes - apparently this signifies attack mode. Olive went straight up and straight back about two to three feet. All while growling viciously at said DVD player. This machine of the devil closed and Olive came over to let me know that she had killed the beast. Ah, how strange our world must seem to the simple, amazing creatures that dogs are. The holidays are coming (there's nothing we can do about it) and yes, it's only about five weeks until Christmas. When looking through some possible shopping items for my loved ones I added an item to my wish list. Suggestions pop up upon adding said item - I added a RR spatula set. The suggested items included, a chic-lit book (okay), a set of RR pots & pans and of course - what all true chefs, RR fans or chic-lit type folks need - the idiot's guide to pole dancing and stripping. Honestly, these are all related and connected, I'm sure. I'm just not sure I want to know HOW they're connected. P.S. - Twilight opens in eight days - EIGHT! I am so excited!! If you haven't read the books, read them, but be sure you have access to all four and the time to read. It's absolutely addicting! I am a complete dork for them and know that, but don't care! That is the life-long question. Our world is now so virtual, so immediate - what do we share that isn't already out there in some way? I've been home sick for three days with an awful flu bug...not fun. I certainly haven't taken sick days, let alone multiple sick days like this in years. Probably not since my neck surgery. To be forced home by exhaustion and fever and to not be able to do things - laundry, clean, bills, etc. is EXTREMELY frustrating. I've never been one to lay around and do nothing. Relaxing isn't my specialty. Planning, cleaning, organizing - now those things I have in spades. And even my sick days, they aren't 100% do nothing - they're check email, voicemail throughout the day. Keep up on details, walk the dog, etc. Take smart phones - I recently gave in to the world and purchased a smart phone that allows me to see email and my calendar by phone. It's awesome, most of the time...but it either rings or vibrates (depending on your settings) whenever you get an email. When you have colleagues or friends that send early morning or late night emails, you can imagine how "interesting" this could be. Yet another piece of figuring out how to balance work and personal life, right? So if you're not to feel guilty about taking personal time, but the immediacy and virtual world demands that you're always connected - is there a balance of the two? I'd welcome comments on how to achieve this - I certainly haven't figured it out yet! On a side note...Olive has been great company as I've been home. A perfect cuddle bug! Do you think people are like fireworks? Some are just plain loud and obnoxious and really serve no purpose at all while some are beautiful, colorful and full of sparkle. Some are shapes, smiley faces and hearts...some are squeal and scream and the best ones shimmer softly and make you smile. This is the very first year that I did not see one firework. The weather was terribly dreary and there were no displays to be seen. The one firework or two we passed on the road, I missed seeing in person. I adore fireworks. I have very happy memories of family members teasing okay you say ooh, you say ahh, and we'll say ooooh! Friends have flocked to various fests and hillsides to douse ourselves in bug-repellent to walk home full of bites and itches but happily chatting away about which ones we liked best. This made me think - I haven't seen one firefly this year either? I'm sure they're out there. I'm sure they're not extinct...but where are they? Is the world so desperately devoid of sparkle? Between fireflies and fireworks, what brings the shimmer to July? I'll be left to see the sparkly reds and blues in the faces of the neighbor with the cute dog, the smiley face in my puppy, the colleague full of sparkle, my friends that are beautiful and colorful and that special guy that is most definitely the slow shimmer that makes me smile. Happy Independance Day to all! Thank you to the men and women that make it possible for all of us to enjoy these freedoms. So all joking aside, this is what I followed to work one day this past week. It made me giggle and picture that little cartoon owl crunching down on a yummy tootsie pop and decide that three was the magic number. I've always heard that if you bit on a hard candy before it's all soft and ready to be crunched, it means you're a very type A personality. 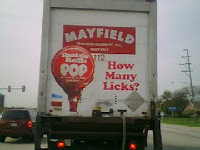 So what does it say about my personality if I follow a truck full of them with no further incident for over 15 minutes?! I have a huge family. Not as big as some of course, but on one side I have something like 27 first cousins. That's a lot of people! So when we have a family get-together and our two bedroom apartment becomes the locale, you can imagine my slight concern that folks would be hanging from the balcony and police would be at the door demanding silence. Alas, no such excitement. Twenty attendees fit wonderfully in our home and we all had a good time. Lots of laughs, food and even a few bottles of wine. And at the end of the day a new friend for me, I think. Nope, not the number of days until God created the world, although that is true and my congrats and appreciation! A minor ailment has plagued me since Tuesday - this has resulted in a call to the Dr., a prescription, a visit to the emergency room, another call to the Dr., an office appt. and two prescrptions... Apparently I'll be cured by Tuesday. At least I'm not part of the media and medical world craze of swine flu, right. Thank goodness for small favors. And one great Mom, that I want to wish Happy Mother's Day to! Thank you for being an awesome Mom, always providing the essentials and so, so much more. For being a great mentor, leader and above all my friend! Love!! A great night! The event was a great success. The team did an amazing job. Completely seemless for our guests! And I think we broke a fundraising record for the event!! My feet may never recover. I didn't even wear the high heels. I wore the wedge heels. Those are supposed to be better, right? Hubby always teases that they are meant to be torture devices and that he doesn't understand why women wear them...but nonetheless we do. And surprisingly enough after ten hours in them my feet hurt even the next day. But my legs looked better than they would have in flats! Professionally: first event as a team "manager" and not the direct planner. It's a different experience. To be part of the moving pieces and machine, but not the cog. I'm incredibly proud of the amazing work the events team has done and can't wait to see it all in action tomorrow. Just a new and different moment today being the one to sit back in the office and still be busy (of course) and helping with various pieces, but not the main point. Regardless, my team rules and the event will be a great night for all. Personally: I'm that person. The person that treats their dog like a child. Hubby called me earlier today worried about needing to board our sweet pup since we'll be gone all evening - gasp! Yup, a night out without the pup!! I've decided that the dear pup can brave the horrors and ravages of her crate for the night. What with the awful cuddly pink bunny and terrifying sounds of her ticking clock and oh - horror of horrors, treats! We'll just keep her out more during the day and give her a bunch of extra love. Hopefully the puppy Gods will forgive me!